At a press launch held at Pinewood on Monday, GTC sponsors Sony launched a new handheld NXCAM camcorder, priced at less than 2000 euros but bringing a host of professional-level features. Sony announced the HXR-NX100, the latest addition to its NXCAM range of professional camcorders with high technology and cost performance. The camera aims to combine great picture quality, easy operability and a wide selection of recording formats in a device that supports multiple choices for a range of professional applications, from events to documentaries. The HXR-NX100 features a 1.0 type Exmor® R back-illuminated CMOS Sensor with 20 megapixels. The sensor, approximately the same size as a Super 16mm frame, delivers high resolution, low noise and great picture quality even in low light conditions, as well as offering good depth of field control. The camera has a fixed Sony G lens, offering 12x optical zoom from 29mm angle of view at wide end that can be increased to 24x with Clear Image Zoom, retaining full resolution thanks to By Pixel Super Resolution Technology. Zoom performance can be doubled with a digital extender up to 48x. These features, combined with built-in 4-step ND filter, mean the HXR-NX100 is well set up to capture quality content in any environment. The HXR-NX100 is ergonomically designed to give a lightweight and easy-to-use form factor. Three independent manual lens rings give simple access to zoom, focus and iris functions. 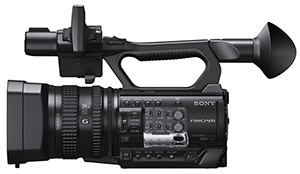 The camcorder also provides a wide variety of connectivity options including HDMI, Multi/Micro USB, XLR terminals, REMOTE, Composite (BNC) and Multi Interface (MI) Shoe, which allows for a wide range of accessories without the need for cables, such as the HVL-LBPC Video Light and the UWP-D wireless microphone series. 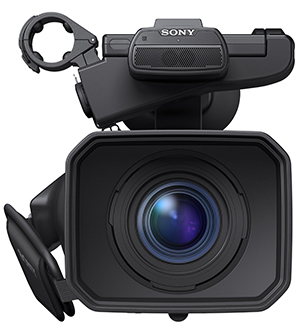 Further extending the recording flexibility of the Sony NXCAM range, the HXR-NX100 is able to record in AVCHD, DV and XAVC S 50Mbps. It records onto affordable and readily available consumer memory cards and features dual media slots, enabling recording onto two memory cards either simultaneously or via a relay mode, with recording automatically switching when the first card is full. 1.0 type Exmor® R CMOS Sensor and Sony G lens: High sensitivity and resolution with 20 megapixel sensor and sophisticated Sony G lens for great detail, colours and wide dynamic range, even in low light conditions (minimum illumination 1.7 Lux*). Maximum 48x zoom for wide range shooting. The lens offers a 12x optical zoom from 29mm angle of view at the wide end, which can be increased to 24x with Clear Image Zoom, retaining full resolution through By Pixel Super Resolution Technology. Zoom performance can be doubled at any point with a digital extender up to 48x. Three independent manual lens rings, built-in 4-step ND filter and other professional functions. Manual lens rings ensure intuitive control of zoom, focus and iris and the built-in 4-step ND filter helps to control exposure in bright scenes. Other professional features include 0.24 type 1550K dots EVF and 3.5 type 1550K dots LCD for easy monitoring, and a wide variety of professional interfaces, including HDMI, Multi/Micro USB, XLR terminals, REMOTE, Composite (BNC) and Multi Interface (MI) Shoe, delivering a seamless integration for video light and wireless audio. Breadth of recording format capabilities: Multiple choices including AVCHD and DV suitable for conventional workflows and newly implemented XAVC S 50Mbps delivering better image quality for professional needs. Dual media slots for recording flexibility. Two memory card slots enable various recording options such as backup, simultaneous, relay and independent recording. The camcorder is compatible with SDXC and SDHC cards as well as Memory Stick PRO Duo (Mark 2) and Memory Stick PRO-HG Duo. “SIMUL” mode permits simultaneous recording to two memory cards, while “RELAY” mode automatically switches recording from the first to the second memory card when the first is full. The user can also use buttons on the camcorder to independently start and stop recording on different memory cards. 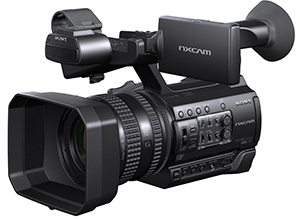 The HXR-NX100 will available in Oct 2015.